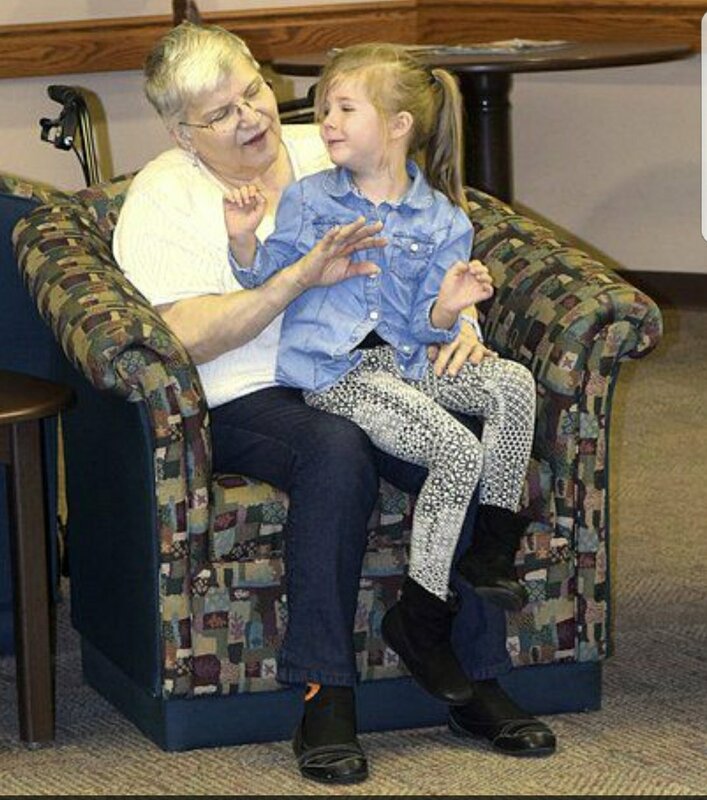 This post is a compilation of two articles I have written for the Enid News & Eagle about intergenerational early childhood education, where preschoolers have class in and are taught with the help of residents of a nursing home. This model has tremendous benefits for both age groups, and has drawn repeated international attention. But what’s most striking is the interaction of the young and old. It will reaffirm your faith in humanity if you ever get to witness it. ENID, Okla. — When parents look for a pre-kindergarten program for their children there a lot of resources and programs that rise to the top of the wish list. But, in most cases, kids don’t have access at their pre-K program to care and attention from a room full of grandmas and grandpas. 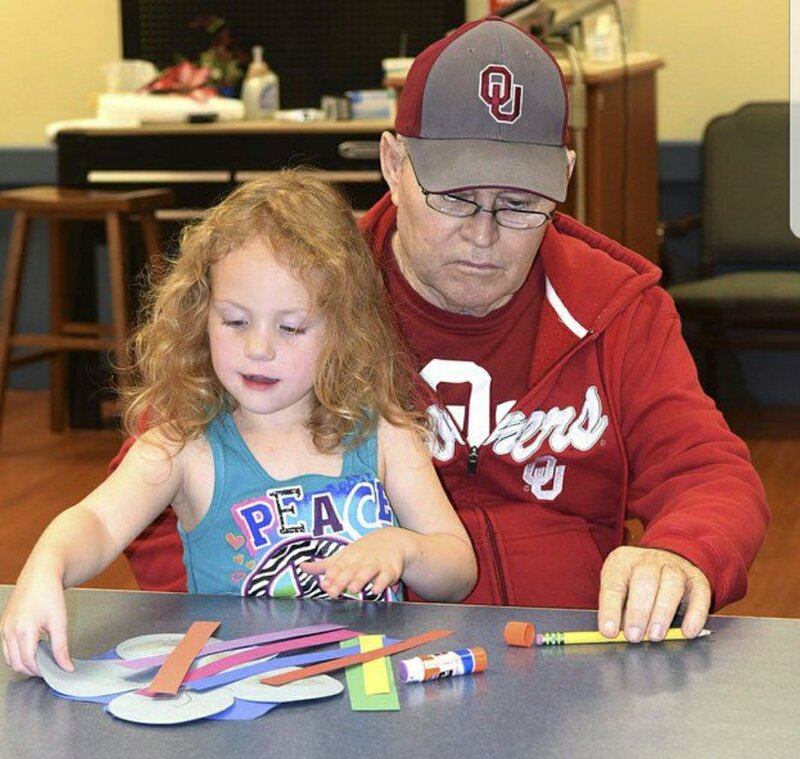 That’s precisely the resource provided in Enid Public School’s intergenerational pre-K program, where selected students attend class with residents at The Commons, a nursing home and retirement village. Parents select whether to enroll their children in the intergenerational program or the more traditional classroom program. For those who attend the intergenerational program, there are learning rewards that go beyond the traditional curriculum, said EPS early childhood education director Chris Smith. Smith visited with the News & Eagle in an activity room dedicated to Alzheimer’s patients at The Commons. Students were busy working alongside residents to cut out and decorate colorful rain clouds and rainbows. Working together with the elderly residents teaches emotional skills to the children, Smith said. 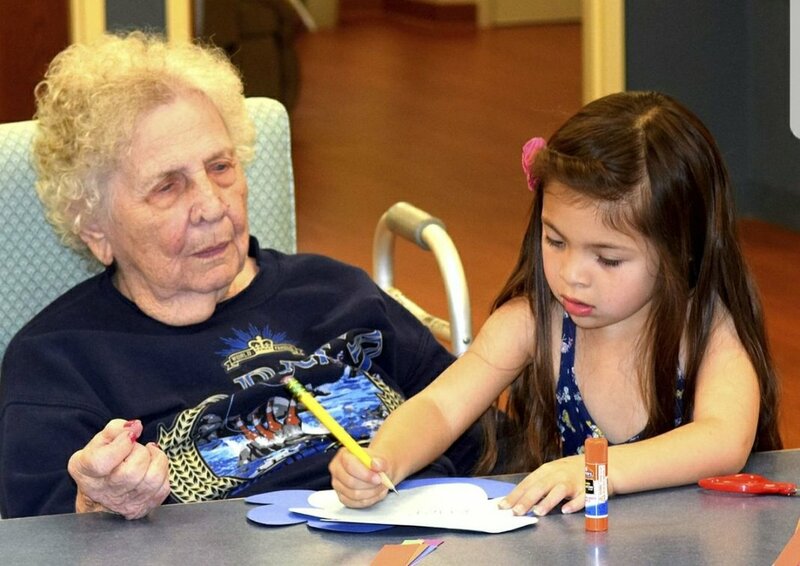 She said working with nursing home residents teaches children patience and sharing skills in ways they might not learn in a traditional classroom. “They learn to share in here even better than working with other children,” she said. But, the lessons don’t all flow from the elderly to the children. “In some ways they teach the grandmas and grandpas, and in a lot of ways the grandmas and grandpas are teaching the children,” Smith said. She said the children provide the residents with a sense of connection to the community, and a purpose in teaching skills and values to a younger generation. That benefit is especially strong when the children visit the rooms of nursing home residents who aren’t able to come out and visit in common areas. The children also are the beneficiaries of some intangibles that can’t be provided in most classrooms. Lisa Scott, administrator at The Commons, said the intergenerational classes also are a benefit to the residents. And, she said, the residents are an invaluable resource to children who might not get much interaction with an older generation. “If a child doesn’t have a grandparent living close by, the residents can really become their surrogate grandmother or grandfather, and it’s very beneficial for both of them,” Scott said. That kind of mutually beneficial relationship is what drew Lorraine George, an early childhood educator and teacher trainer, from her home in Torbay, in southwest England. She said she first heard of the intergenerational learning concept in early childhood education from a school in Seattle, Wash., and then began researching other schools she might be able to observe so she could implement the program in England. Last year, she submitted a grant application to the Winston Churchill Memorial Foundation, which funds 100 grants each year for Britons to study abroad and bring back innovative ideas to implement at home. George was one of 100 grantees selected from among more than 1,300 applicants. She visited Enid on Wednesday as part of a tour that includes schools in Seattle, Oklahoma City, Clinton, Jenks and several stops in Kansas. George said intergenerational early childhood education may be a new concept in Britain, but it is one that begs to implemented. Upon her return to England George plans to write and publish a research paper of her findings, advocating for broader use of the intergenerational learning model in Britain. George’s visit was not the first time the EPS program has drawn attention from visiting educators. Teachers and researchers from as far away as Australia and South Africa have visited to observe the class, and representatives from the Chickasaw Nation and Oklahoma County visited The Commons in May in hopes of learning aspects of the program they could implement at home. Key said she was overcome with emotion while observing the interaction of the children and nursing home residents. Stacy Dykstra, with Smart Start Central Oklahoma, a nonprofit that works to foster early childhood learning opportunities in Oklahoma County, also visited in May. She said she was drawn to the program because the “soft skills” being taught in the intergenerational program are invaluable. Dykstra said teaching children the skills of empathy and compassion is essential to building a better future for society.